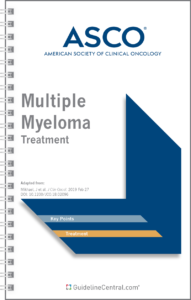 The Bone-Modifying Agents in Breast Cancer GUIDELINES Pocket Guide is based on the latest guidelines of the American Society of Clinical Oncology and was developed with their collaboration. 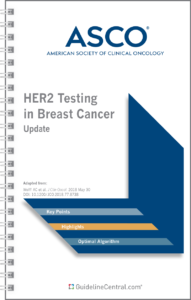 It contains recommendations for the adjuvant use of bone-modifying agents in breast cancer. In women, breast cancer is the most common cancer, accounting for approximately 25% of all cancers. Despite improvements in long-term outcomes for early breast cancer, recurrence and death rates are still significant. Bone remains the most common site of breast cancer recurrence. Where benefit exists, the value of adjuvant bone-targeted therapy tends to be in women with a “low estrogen environment,” either through menopause or suppression of ovarian function. It is recommended that administration of bisphosphonates as adjuvant therapy be considered for postmenopausal patients (including patients premenopausal prior to treatment who have menopause induced by ovarian suppression as detailed in Recommendation 5) with breast cancer deemed candidates for adjuvant systemic therapy. The final decision whether or not to administer bisphosphonates should be made during consultation between the patient and oncologist, taking into account patient and disease characteristics including risk of recurrence, and weighing the potential benefits and risks (adverse effects). Zoledronic acid and clodronate are the recommended bisphosphonates for adjuvant therapy in breast cancer. There is need for more information comparing different agents and schedules, and it is recommended that such trials be conducted to establish the utility and optimal administration of other bisphosphonates for adjuvant therapy. While results for adjuvant denosumab look promising, data is insufficient at this time to make any recommendation regarding its use in the adjuvant setting. It is recommended that studies directly comparing denosumab and bisphosphonates and evaluating administration schedules be conducted. For patients who will receive adjuvant bisphosphonates (see Recommendation 1), zoledronic acid at 4 mg intravenously over 15 min (or longer) every six months for three to five years or clodronate orally at 1600 mg/day for two to three years is recommended. Different durations may be considered. More research is recommended comparing different bone-modifying agents, doses, dosing intervals and durations. For purposes of adjuvant bisphosphonate use, the definition of menopause should include both natural menopause (at least 12 months of amenorrhea prior to initiation of chemotherapy or endocrine therapy) and menopause induced by ovarian ablation or suppression (but not the cessation of menses due to chemotherapy alone). In women age ≤60 years with a previous hysterectomy and ovaries left in place, luteinizing hormone, follicle-stimulating hormone, and serum estradiol should be in the postmenopausal range and measured prior to initiation of any systemic therapy in order to receive adjuvant bisphosphonates. A dental assessment is recommended where feasible prior to commencement of bisphosphonates, and any pending dental or oral health problems should be dealt with prior to starting treatment if possible. Patients should be informed of the risk of developing osteonecrosis of the jaw (ONJ), especially with tooth extractions and other invasive dental procedures. Patients should inform their dental practitioner of their treatment. Patients with suspected ONJ should be referred to a dental practitioner with expertise in treating this condition. Recent guidelines or position papers by groups such as the International Task Force on Osteonecrosis of the Jaw, the American Association of Oral and Maxillofacial Surgeons and the American Dental Association should be consulted. Patients should have serum calcium measured prior to starting treatment. Patients receiving intravenous bisphosphonates (zoledronic acid) should be monitored for renal function prior to starting this treatment, and for serum calcium and increase in serum creatinine throughout the treatment period. Calcium and vitamin D supplementation is recommended unless otherwise contraindicated. Oral bisphosphonates and calcium should not be taken concurrently — several monographs suggest an interval of at least two hours to allow maximum absorption. Symptoms such as ocular pain or loss of vision may be due to serious inflammatory conditions such as uveitis or scleritis and should be promptly evaluated by an ophthalmologist.